Aloo Tikki is one of the most popular North Indian street food. It is basically made of boiled and mashed potatoes mixed with various herbs and spices. It is then deep-fried in oil. Well, you may all know that “Aloo” means potato and “Tikki” means a small cutlet or also called as patties. Aloo tikki is a famous street food and is found in almost every chaat shop or small eateries or stalls in almost every part of India. In Mumbai, a popular version of aloo tikki served with various spicy chutneys such as the coriander- mint chutney, Tamarind – dates chutney and this version of aloo tikki with spicy chutney is called as ‘Ragada Patties’. Aloo Tikki is an Indian appetizer that can be served in many different ways. Top it with a little mint and tamarind chutney, onions, cilantro, sev and it is a delicious chaat. Make the tikki a little bigger and use it as a patty for a satisfying veggie burger. Make them tiny and serve as appetizers. 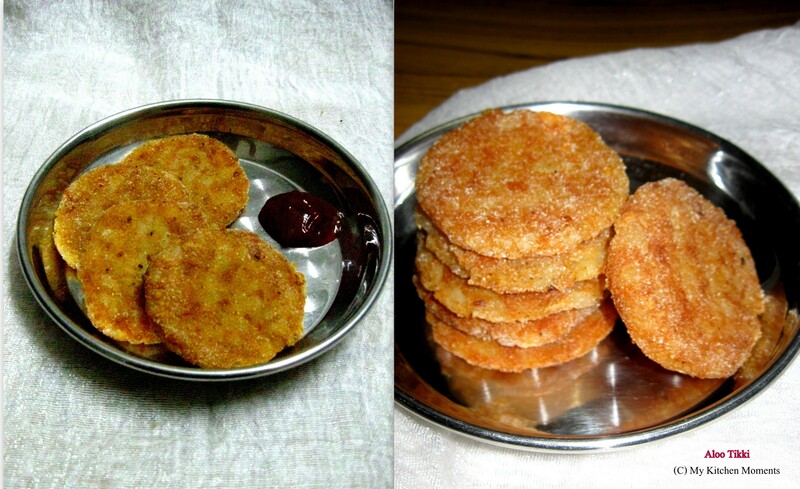 Yes, Aloo Tikki is one of the very versatile and yummy snack. Cut each potato into halves and pressure cook upto 4 whistles or until soft. Once the pressure leaves the cooker, remove the boiled potatoes, peel off the skin and mash it well without any lumps. Add red chilli powder, garam masala powder, cumin powder, chat masala powder, lemon juice, coriander leaves and required salt to the mashed potatoes. Mix well to form a smooth dough. Take a lemon sized ball and roll it well between your hands. Then flatten them into round shaped patties between your hands. Roll the patties in rice flour so that it coats well on all sides. Now finish the mashed potatoes dough by repeating the process. I just made around 12 tikkis. Heat dosa pan or a small tawa. Add a teaspoon of oil and add the prepared aloo tikkis ( 3 to 4 patties at a time) and toast them well on both sides till they turn golden brown and slightly crisp. Serve hot with tomato sauce or sweet chutney or coriander chutney. Optionally you can coat the tikkis with breadcrumbs and then toasting gives a crispy outer layer and soft inside. I used coconut oil, as it is the main oil used in most of the Kerala home for preparing food. Some may not like the taste of coconut oil, but we at home love coconut oil and it renders that specific taste which is so common in all of the Kerala dishes. And health wise also, coconut oil gives out more benefits. You can even add 1/4 cup boiled peas along with potato. And a tsp of finely chopped green chillies for that extra spiciness. You can also add a tsp of amchur powder instead of chat masala powder.. The dough should be tight enough to hold together, if the dough is watery / runny then your tikkis will break when you toast them. During such times, you can add 1/2 tbsp cornflour if the dough becomes watery, but dont add more as the tikkis will become hard. Alternatively you can deep fry them too. But if prefer to deep fry then add rice flour or cornflour with the dough to make it stiff. If you are toasting, toast in low medium heat. You can even toast the tikkis in ghee, but if you want less oil or ghee then you can use the air fryer to toast the tikkis. 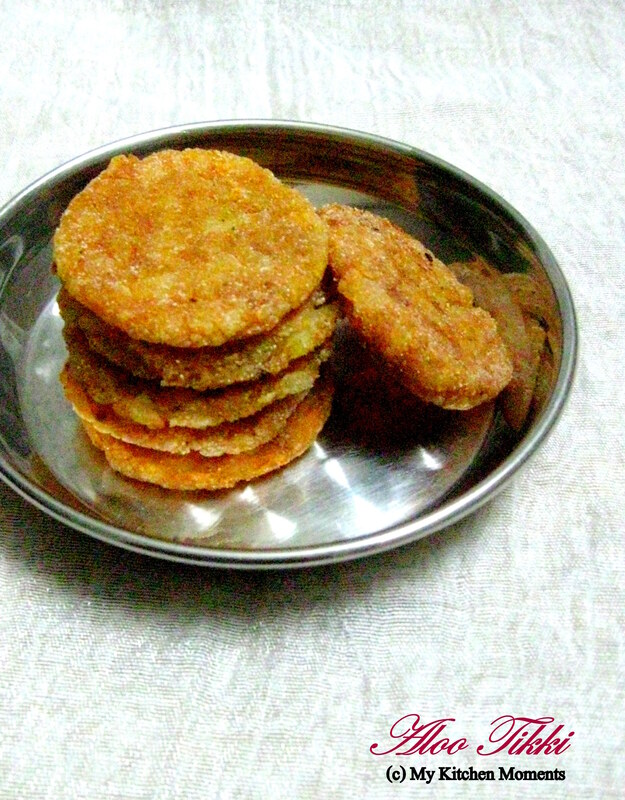 Flip over the tikkis gently while toasting them in tawa for even roating on all the sides. You can even stuff boiled channa dal / sprouts/ mixed vegetables inside the tikkis for taste variation. We make something like this as well sometimes from left over potato filling from another dish, so yummy. I actually had this over the weekend at an Indian banquet hall where they served these potato patties as an appetizer with chickpeas cooked in a sauce, I loved the combination! I like the use of rice flour. The tikkis must be very crisp! Sure! You will love it 🙂 How are you doing?? How is life? Thanks for following me on google+, good to connect with you. I’m exploring your site and amazed to see your kitchen adventures. Have a nice week ahead! Thank you 🙂 They were indeed delicious!! A series of baking adventures. The blog for everyone who loves creative baking and cooking!